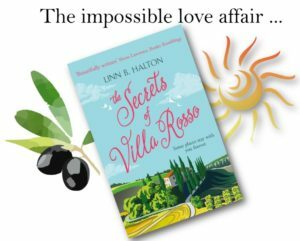 I’m pleased to be on the blog tour today for The Secrets of Villa Rosso by Linn B Halton. I’ve got a short extract for you along with my review, and there’s a fabulous giveaway too, but first here’s what it’s about. It isn’t just the sunshine and the electric blue sky, but the musical calls of the countryside that reach out to me. A chorus of low-level sounds play like a soft melody in the background. It’s breathtakingly beautiful and I feel like I’m watching a re-run of a favourite film. I could stand here for a long time simply taking in the detail and with each sweep of my eyes noticing something new. Spinning around I look back at the villa, taking in the rustic beauty of the stonework and the pale orange-red hue of the sun-bleached roof tiles. This is, quite simply, unreal. It’s a little piece of heaven and, so far removed from my daily life that it’s hard to believe this is on the same planet. The sheer scale of the landscape literally steals your breath away. I’m a mere speck, small and insignificant in the grand scheme nature is presenting to me. But rather bizarrely, it doesn’t feel alien in anyway at all. The vastness isn’t overwhelming, but strangely comforting. I walk back to a cluster of wooden tables surrounding a small fountain and take a seat. As I dive into my bag to extract some sunglasses, I hear a polite cough and look up at the face staring down at me. I stand, automatically plastering a pleasant smile on my surprised face as recognition kicks in. I know this man, I mean, I’ve met him before. At least I think I have, but there’s nothing similar reflected back at me, only a warm smile. The sort of smile that radiates out from mysteriously deep, hazel eyes. We shake hands. He’s younger than I expected, probably in his early forties and tall. Six foot something that’s for sure, because I feel he’s towering over me. Such an atmospheric extract about a lovely setting. I was so drawn to this book when I realised it was set in Italy. Such a beautiful country, I’m a complete sucker for anything set there. Ellie Maddison is married to Josh, her soulmate, with two teenage daughters. 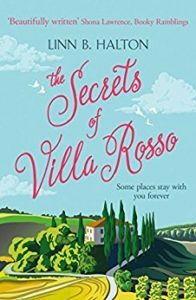 By chance she is sent to Italy on a buying trip to meet Max Johnson who runs Villa Rosso and she has this sense that she knows him already. There’s a strong connection between the two of them that Ellie can’t shake off even when she returns home. It’s an unusual storyline. I think the crux of it is that you can feel that connection to somebody without ever having known them, a sense of having being in that place with that person before. Ellie is devoted to Josh (who I thought was a bit pathetic and annoying, to be honest) but feels this uncontrollable pull towards Max (who I much preferred!). I thought the setting was perfect and really well described. I could almost imagine myself there. I liked Ellie well enough and I liked Max as well, but the book overall lacked a bit of something for me. I found it a pleasant and easy read with an interesting storyline but I think the problem for me was that there was a lot of unexplained underlying tension and I was expecting more to the ending than I got, although to be honest I don’t know how the story could have been wound up differently. I was going to call it a romance novel but it’s not quite that. It has a romantic feel to it certainly but there’s also a kind of paranormal element. I think this book will appeal to readers of romance and people who enjoy a strong sense of place. I’ve really struggled over this review as I did enjoy reading the book but maybe it just wasn’t quite right for me. I know how popular this author is though and she has tremendous appeal. Thank you to Harper Impulse and Brook Cottage Books for the review copy and the place on the blog tour. 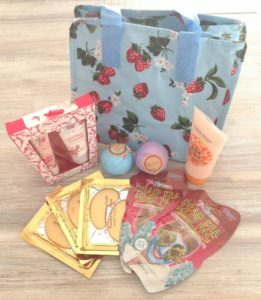 Now here’s your chance to win a fabulous pamper kit. No purchase is necessary but it is UK only. Bristol-born Linn B Halton lives in the Forest of Dean, in the UK. An Amazon UK Top 100 best-selling author with A Cottage in the Country in November 2015, Under the Stars and A Little Sugar, A Lot of Love also became best-sellers in 2016 & 2017. Linn’s novels have been short-listed in the UK’s Festival of Romance and the eFestival of Words Book Awards. Linn won the 2013 UK Festival of Romance: Innovation in Romantic Fiction award. 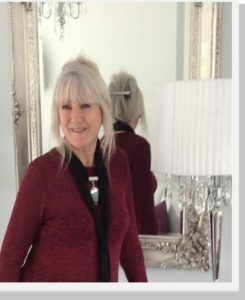 Linn writes chick lit, women’s contemporary fiction and psychic romance for Harper Impulse, Choc Lit and Endeavour Press. My pleasure, Linn. Italy is such a beautiful country. I’ve been a couple of times but probably to more tourist/holiday destinations. It’s worth going off the beaten track, Nicola – I can thoroughly recommend it! Thanks, Linn. I do like places that are like hidden treasures.